Basundi is a sweetened dense milk made by boiling milk on low heat until the milk is reduced by half. In North India, a similar dish goes by the name "Rabri| Rabdi" which is served with Malpua or Jalebis. Basundi is thick sweetened milk, but Rabri is thick milk with layers of malai in it. Rabri is richer than basundi. Basundi is a Indian dessert mostly in Maharashtra, Gujrat, Karnataka. 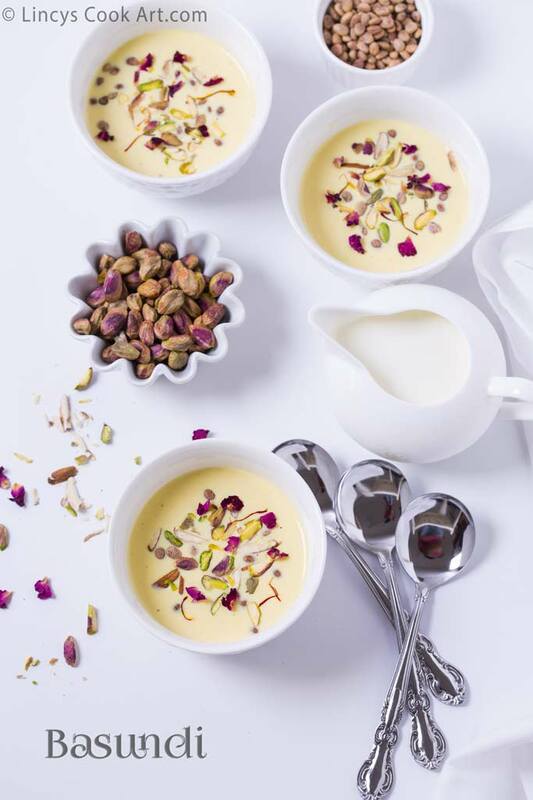 This reduced milk is flavoured with cardamom, charoli(nuts) and or saffron. It is generally served chilled and garnished with slivered pistachios and almonds. Variation are also available with fruit flavours and with added mini rasgullas too called angoor basundi. Getting rich milk is easy nowadays s by adding some condensed milk on to the milk mixture. At this stage add the condensed milk if you wish to add and keep on stirring till the milk further thickens and the malai (yellow fat layer of milk) starts to form on top. Cook further more to make it thick by scrapping the sides frequently. Add the crushed nuts and cook for 2 minutes and switch off the gas. Allow the basundi to cool for about 1 hour and refrigerate and serve chilled. I have added a pinch of turmeric to enhance the color if you add more saffron it will over powder the dessert. You could add turmeric powder or yellow or orange yellow food colour. Whole process of making basundi constant stirring and scrapping the vessel and removing the fat layer forming on top using a ladle is essential to get a creamy texture. Adding condensed milk in this recipe is optional. but it gives a creamy texture. If you are not adding condensed milk cook the milk 5 minutes more to get to get more creamy consistency. Looks so creamy and rich dessert! happy diwali!